Meet Bucky the Deer, Fred the Moose, Tex Longhorn, and Wayne the Bass designed by nature lovers and Cardboard Safari founders Chris Jessee and Luis Rodrigalvarez. 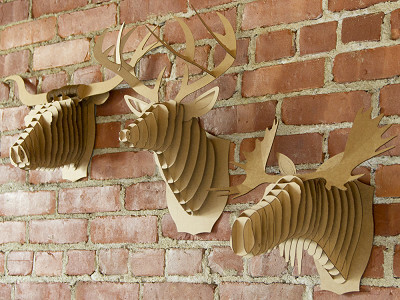 Located in Charlottesville, VA at the foot of the Blue Ridge Mountains, the company draws its inspiration from surrounding wildlife to create cruelty-free, environmentally friendly recycled cardboard animal trophies for your walls. Cardboard Safari creations are laser cut for precision fit and easy assembly using slotted construction. Each package comes flat-packed with detailed directions. Intended for ages 14 and up. But with the help of a parent or grandparent, we think kids as young as eight years old can enjoy this 3D craft. People of all ages in all stages of life are sure to admire the results. Lightweight and simple to hang over a mantel, in an office, or even in a baby nursery, these works of art are a fun way to bring the a bit of nature to the indoors. Their native brown color complements any décor. For the holidays or just for fun, dress them up with paint, glitter, wrapping paper or just about any other craft materials. Take a walk on the wild side within the walls of your own home. Howdy Grommet enthusiasts, I’m Chris Jessee, founder of Cardboard Safari. It’s great to be featured on today’s Grommet. Please let me know your questions. In the future, will you be adding new animals to your collection like lions, elephants, or bears? Could these be custom ordered? If you contact The Grommet customer service at [email protected], they will be able to put you in touch with me for other animal options. 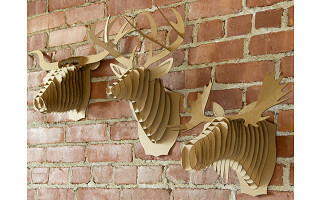 Meet Bucky the Deer, Fred the Moose, Tex Longhorn, and Wayne the Bass designed by nature lovers and Cardboard Safari founders Chris Jessee and Luis Rodrigalvarez. Located in Charlottesville, VA at the foot of the Blue Ridge Mountains, the company draws its inspiration from surrounding wildlife to create cruelty-free, environmentally friendly recycled cardboard animal trophies for your walls. Cardboard Safari creations are laser cut for precision fit and easy assembly using slotted construction. Each package comes flat-packed with detailed directions. Intended for ages 14 and up. But with the help of a parent or grandparent, we think kids as young as eight years old can enjoy this 3D craft. People of all ages in all stages of life are sure to admire the results.